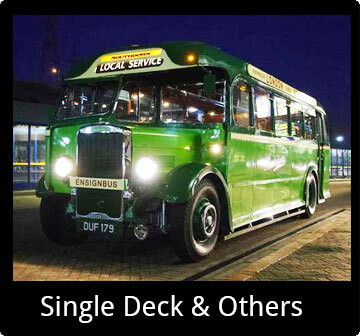 We have the UKs largest and most diverse collection of buses available for hire including unique brand new, high capacity, seat belted and air conditioned double decks [find out more here], quirky open-top buses and of course our extensive selection of vintage buses including London’s famous ‘Routemaster’ buses and the generation before it, the elegant RTs. 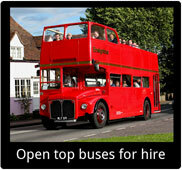 These are available for any occasion including Weddings, Day Trips, Promotional and Filming use. 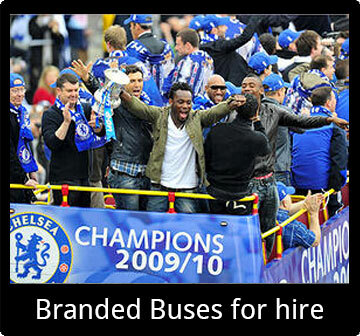 You can also brand our buses for promotional events - take a look here. Add that special finishing touch to your big day! Your wedding day is probably one of the most important days of your life, and of course you want it to be a memorable one, not just for you and your partner, but also for your families and friends. Ensignbus has a large collection of vehicles from different eras, ranging from the 1930's to modern day. View our buses online to find the one that suits your needs the best, then simply fill in an online enquiry form or speak to our hire team direct on 01708 86 56 56. We are happy to help and will make sure that your hire goes as smoothly as possible.